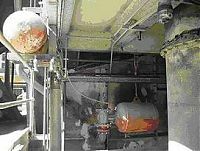 Do you have a bottle-neck, WH&S issue, inefficient process, dust problem, blockages, conveyor spillage, loading/unloading issues, plant upgrade, lubrication problems, don't know how to move something? C-Mac and Aaxiom both located under the same roof now work closely together providing the material handling solutions. 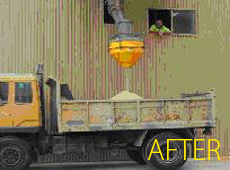 Truck load out point before and after photos. No power or compressed air required in designed system. 5 years in operation using dust products greater than 5mm in particle size and requiring very low maintenance. 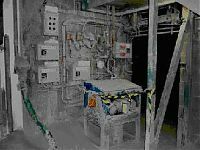 Upgrade to a lime crushing plant dust collection system. 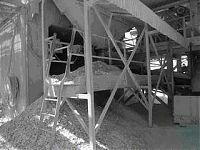 The dust is sold as agricultural lime, revenue from the additional dust collected has a 1 year pay back on the system. 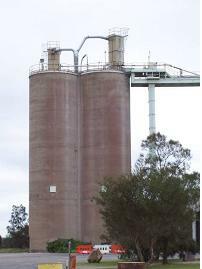 Upgrade to a large silo dust collection system. 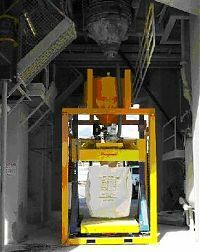 Designed to allow for simultaneous loading from bulk trains, and from the pneumatic conveyance directly from the mills. We have developed various chute design and mechanisms to prevent blockages and hang ups from occurring. Chute below blocked on average twice a month on this project, after $2,000 modification to the chute no more blockages occurred under normal working conditions. Sticky burnt lime required air blasters to control material build up problem. Spillage control may require a different approach at times to eliminate the root cause of the problem. Example 1. 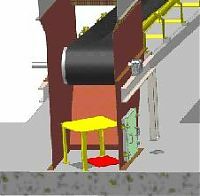 The conveyor below has two scrapers and an automatic brush. After conducting an inspection, it was revealed that the belt had hair line cracks causing the carry back of product. Once the belt was replaced the issue was resolved. Example 2. 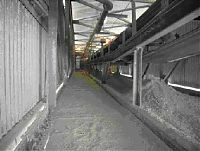 Spillage at conveyor is caused by material dropping 2.4m straight on to the belt conveyor. Below are the two measures put into place to control the spillage. a) Baffle plates to slow down the material. b) A cascading rock box to centre the material onto the belt. 6 years in operation and still working well. Example 3. Screw conveyor spillage caused by material surge as part of the process. This was controlled by a VSD and level sensor. No mechanical modification was required. These are examples of before and after lubrication systems we have updated. 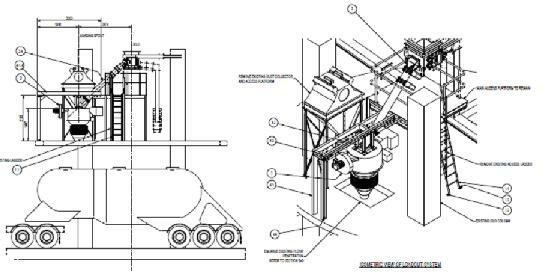 We design build and install "Mobile Bulk Bagging system", designed to interface with any truck loading facility and can load bulk bags up to 2.5T with ± 2kg accuracy. Unit can be moved using a folk lift truck. 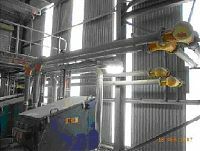 We provide a range of material conveying solutions including; pneumatic conveyors, bucket elevators, belt conveyors, screw conveyors and drag chain conveyors. Example 1. 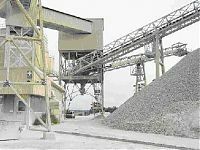 Below a Lime Stockpile stage, was put in to increase the plant flexibility in suppling a wider range of products to the market. Example 2. Bulk Tanker load out point designed. The load out points are faster, more accurate with built in dust collector. Example 3. 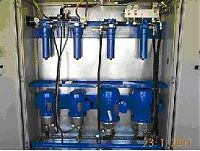 Water injection system used to control a chemical process. The system has been working with great accuracy and reliability since it was installed 4 years ago. Example 1. 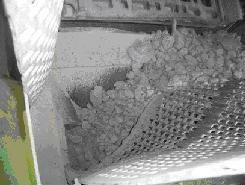 Before and after photos of a clinker storage bin. 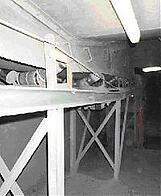 Previously the shut-off gate required two fitters for 3 hours to close and reopen the gate. With this simple modification the gate can be closed in minutes by a process person. Example 2. Upgrade to a bucket elevator drive. The shaft mounted motor gearbox arrangement replaced a motor, coupling, gearbox and chain reduction. The simplicity of this upgrade reduced maintenance time on this upgrade by 70%. 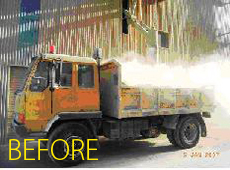 Before and after photos of a sampling system from bulk tankers. This system eliminated the manual handling and improved quality of the samples by taking a composite sample. The kilm access ramp. This clever design allowed for a safe access into the kiln with 15 minute set-up time. A reduction from 1.5 hours for the original set up. Example 1. 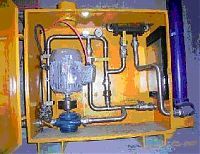 Below is a water separator we designed to handle compressor condensate. Had to comply with EPA and water authorites requirements. Example 2. 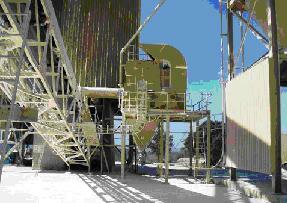 Photo of a lime plant in which a number of modifications were made to bring the various equipment to an acceptable noise level.